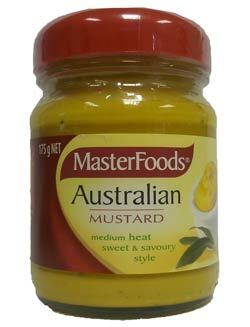 Masterfoods Australian Mustard is undoubtedly Australian and has that great taste of home. With a sweet pickle flavour and medium heat it goes great on hot dogs, burgers or with cold meats. Water, Mustard Seed 19%, Salt, Acidity Regulators (E260, E330), Soy Lecithin, Palm Oil, Spices, Colour (E160a).